Ingredients needed for ONE dinner. Fresh mushrooms, optional but highly recommended! Salt, pepper and Mrs Dash. 2 sheets of heavy duty aluminum foil, 1 1/2 ft long. Form hamburger in a patty. 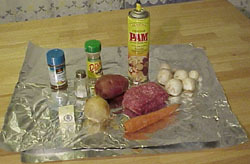 Place aluminum foil on flat surface. Spray 1 foot circular area in center of foil lightly with non stick spray. Place one slice of butter in the center of the foil. Position the hamburger patty on top of slice of butter. 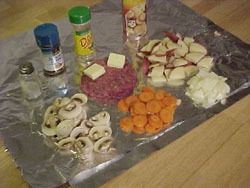 Sprinkle sliced onion, potato, carrot and whatever else, on top of the hamburger. Place 2nd slice of butter on top of the vegetables and sprinkle generously with seasonings. For the following steps, keep in mind that you want your foil dinner to be as compact, flat and air tight as possible. Grab the opposite edges of the foil sheet and pull upward until the edges meet. Roll these two edges together tightly. Now flatten the dinner firmly. Roll the ends of the foil dinner tightly toward the center. 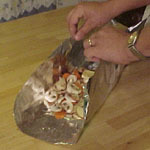 Flip the dinner over, and place in the center of the second sheet of foil. Repeat the folding and rolling process. Refrigerate until ready for use. The foil dinner may also be frozen, and used later. Building a fire for a foil dinner. For a charcoal fire: Use 3 large bags of charcoal for every 20 foil dinners. 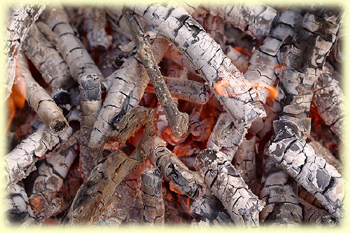 Regular fire: Build with hard wood, and wait for lots of coals. Indoors campers: Set oven on 400. Spread coals out evenly in a rectangle shape and place foil dinners 2 inches apart. Cook for 10 minutes on each side, depending of the temperature of the fire. Be careful when flipping dinners, not to poke a hole in the foil. Carefully remove foil dinners from fire and allow to cool. Open dinner and chow down with ketchup, mustard or other condiments. Other meat may be substituted for hamburger like, steak, chicken or fish. Add other vegetables as you like. A 3rd sheet of foil may be added for better results in cooking.It helps keep it sealed. Have boys prepare their own dinner at home and bring it to the camp out for use as the first meal of the camp out.